Less than two weeks until Connecticon!!! I cannot believe how quickly this event is coming up. It’s because I’ve been busy lately, and I just haven’t had any time to prepare. I haven’t even figured out my cosplay schedule entirely yet!! Though I do have some exciting news. First off, I am scheduled to be in a Legend of Zelda photoshoot sporting my sheik costume, which I am still reworking a tad. I need to find a way to get the tanto to be both removable, and firmly attached with out flopping all over the place. For Anime Boston I just sewed it right to the back of the costume, and it stayed on very well, but sitting down, especially in cars became a problem. So I’m messing around with some magnets hoping to find a more comfortable solution. Anyway, the photoshoot is going to be at night, which sounds very appropriate for our Twilight Princess designs. Secondly, I was accepted into the Cosplay chess even at Connecticon. The event is scheduled for Sunday afternoon at 12 pm. I’ve never participated in a cosplay chess before, but I do have a couple of friends who were also accepted. Funny coincidence with that story; my boyfriend and I signed up separately to participate in the Cosplay chess, neither one being guaranteed a spot in the event, and neither one of us having any connection to one another on the applications. But as fate would have it, the chess coordinator assigned Josh (Ike) to be my (Sheik’s) special attack! I was very pleased. So much chuckling; I thought it was a great coincidence because we now have extra time to coordinate our “special attack.” Then Josh mentioned that the coordinator simply may have seen us together in photos on Cosplay.com or in our reference and put us together for that reason or was at least influenced by the cosplay pictures of us together….but I still like to think that its just an awesome coincidence. I will be sure to let you all know how the event goes!! I’m super excited. Next up, Tatiana Wisla. Work in Progress. So I’ve chosen, and started sewing….I’ve decided to tackle the task of making a long-time personal cosplay wish come true, by constructing a Tatiana Wisla costume from “Last Exile.” Tatiana is a strong-willed, overconfident-but-talented wing commander and vanship pilot from the series “Last Exile.” Why do I want to make this costume? I love the series. Loved it when I first watched it, loved it when I watched it again. I am due for another watch because I’ve forgotten some of it by now. Its been a few years, but hopefully I will love it just as much the third time around. My second reason for making the costume is because its just so darn cool looking!! I feel like with the right amount of planning and research, I can do this thing justice. I haven’t set a deadline for myself because I want to really take my time. But hey, if it’s ready for Connecticon in a month, yeah I’ll wear it! Though it really, probably won’t be ready. This costume–I’ve already found–involves a lot of hand stitching. 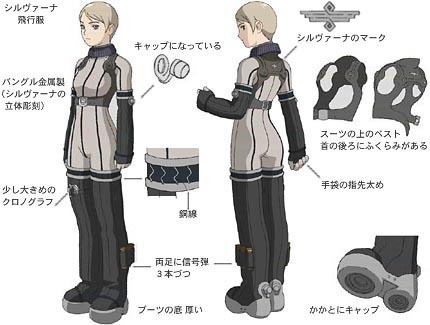 Her pilot suite consists of a front-zippered tan/gunmetal/gray/creme catsuit, (Colors vary with the picture you look at) with thick, padded, black/brown/gray arm and leg warmers. She is also wearing a harness that seems to be made out of the same material as the arm and leg warmers. Other aspects of the costume worthy of note are her weird shoes. They have quite the platform, and are hollowed out on the bottom; I have a few ideas as to how to make them, but I am still thinking about it…and I anticipate plenty of challenges with that. Anyway, the part of the costume that I have begun is her arm and leg warmer-things. I have chosen a wonderful costume-pleather with a polyester lining. 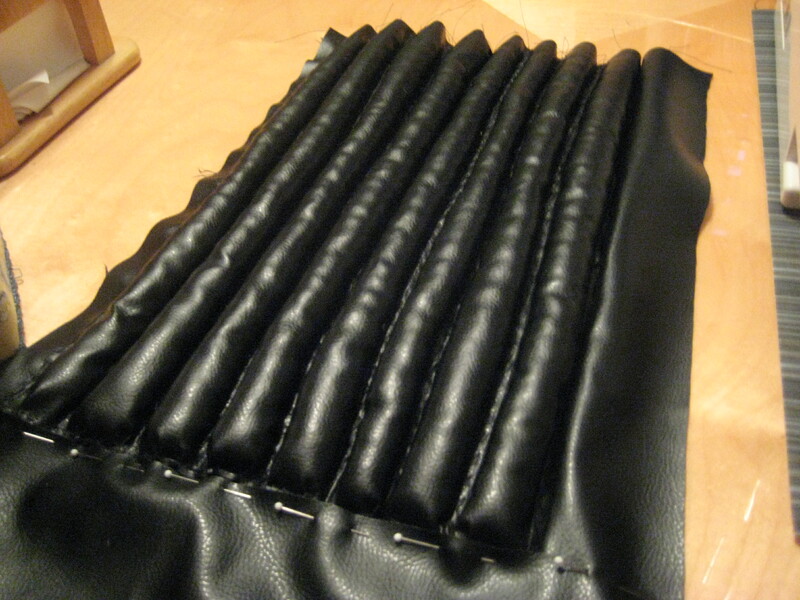 I am basting all of the padded tubes by hand before running it through the machine because the difference in the weights of the fabrics is causing problems. But so far, so good. I love the way these things are looking so far and I can’t wait to add the embellishments and have some super-styling sleeves.